Last night Andrew made us dinner. We decided on his Mom’s Meatloaf. Andrew’s mom is a Fantastic cook so I was super excited about this meal all day. I was hoping that this recipe did not turn out like the last one Andrew cooked…in case you do not remember he nearly burned down the kitchen haha…..the meal did turn out great though after the smoke cleared out. 🙂 He really is a good cook, he just has a bit more of things to learn around the kitchen. 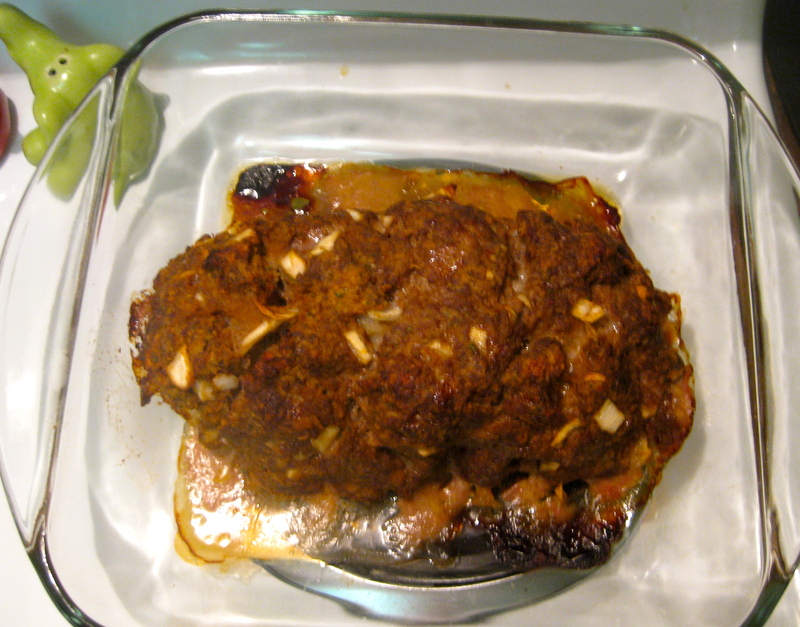 His meatloaf came out PERFECT! Andrew and I took it easy the rest of the night because we are going downtown with some friends tonight and we are trying to get extra rest for the big race next weekend! We watched the movie Ted after dinner…it was Hilarious! It started raining last night and it was so peaceful falling asleep to the sound of the rain. I woke up bright and early this morning and it was still raining outside. 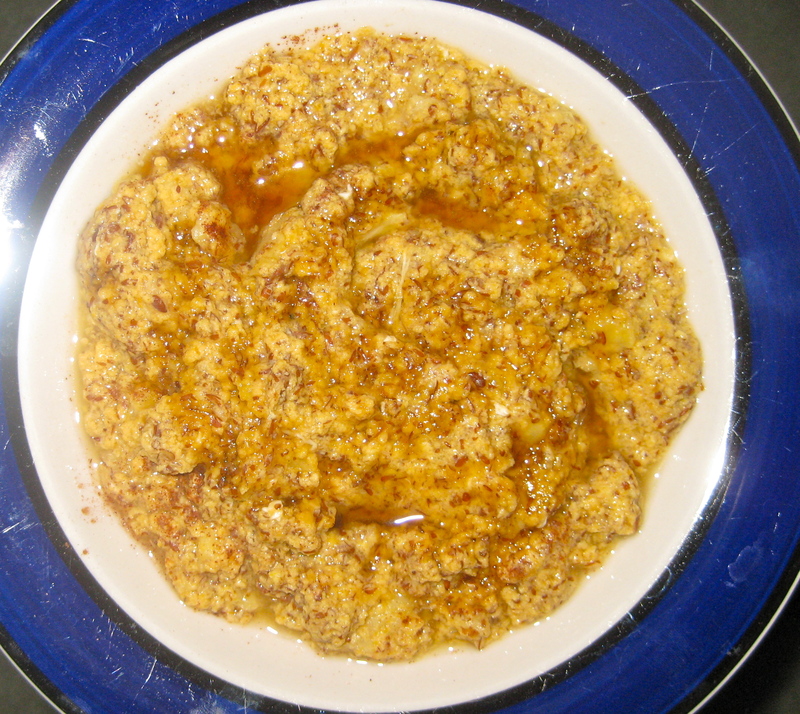 I made my “Oatless” Oatmeal for breakfast with a 1/4 cup pumpkin puree added in….Deeeelicious! After yoga we were both pretty hungry. 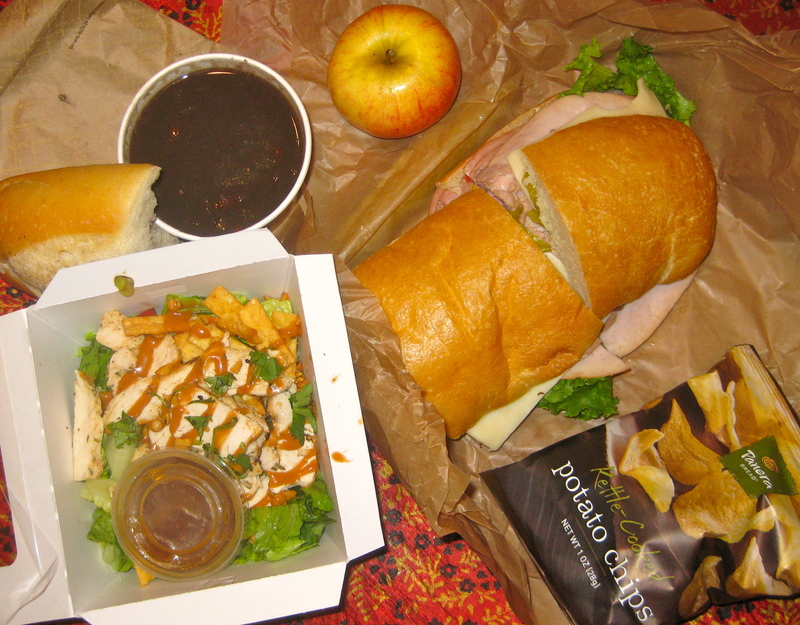 It took a while for us to both agree on a place to eat but we eventually decided on Panera Bread. YUM I always get the “Pick 2” deal. 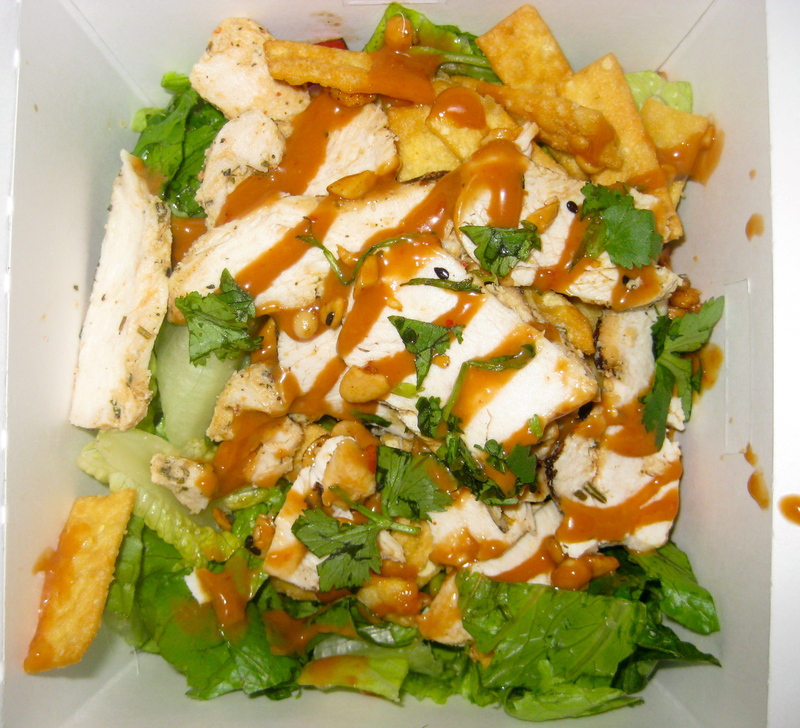 I had 1/2 a Thai Chopped Chicken Salad with a cup of Black Bean Soup….It totally hit the spot on this rainy day. Andrew got one of the meatiest sandwiches on the menu, the italian combo….like always. We had to hurry back and get it to-go because Andrews Soccer Team, Manchester United, was playing at 12:30. So Andrew and I have our half marathon next weekend. I can not believe it is almost here :). I am so excited/anxious/nervous! I am trying to take it easy from now till the race so today I decided on a 3 mile run. I did my first 2 with Chewbacca and he did great! 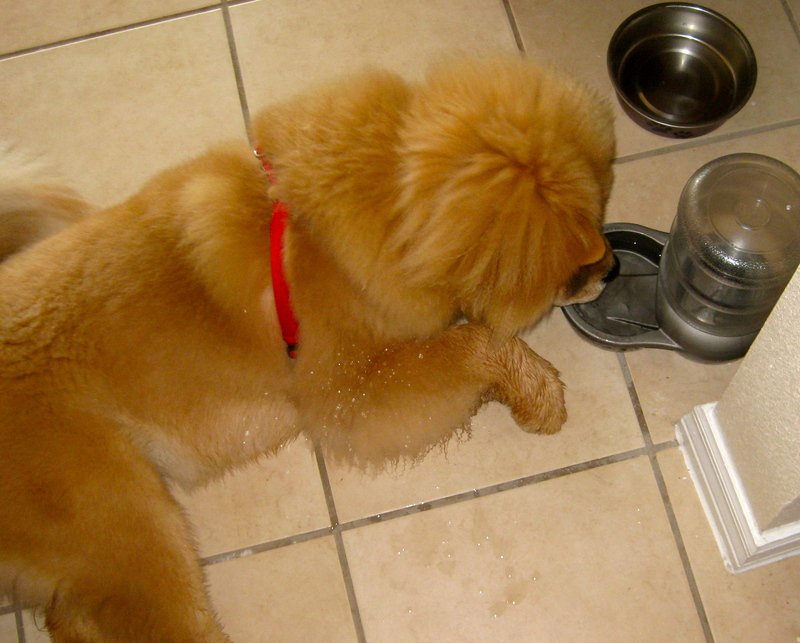 He was so worn out by the end of it that he didn’t even want to stand up to drink his water. He just layed down in front of it to drink haha. Since I have the 5K Sunday morning I was anxious to see how fast I could run it in. 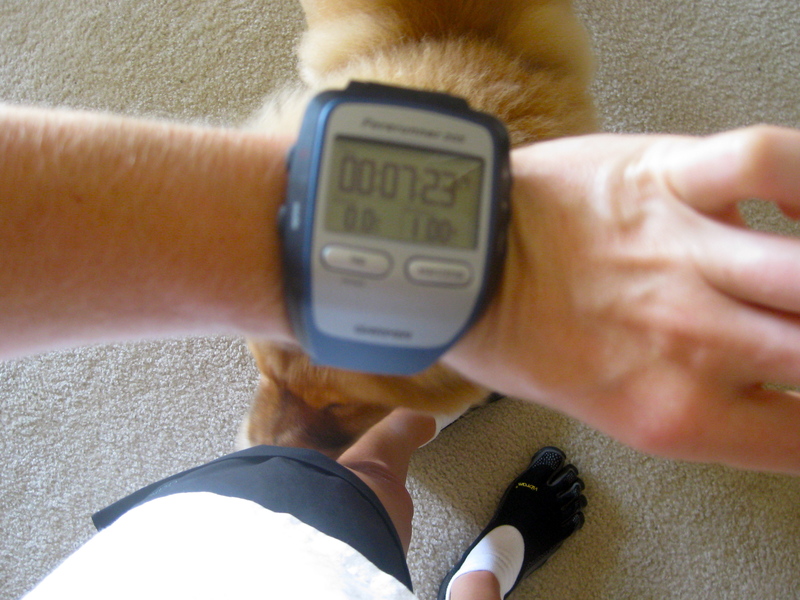 After I dropped Chewbacca off at the apartment I decided to see how fast I could run a mile. I did it in 7 mins 23 secs. I am hoping that I can keep this pace for the 3 miles on Sunday. Chewbacca loves to give me kisses when I get back from my runs/lick my sweat..
For Breakfast I made my Chi Chi Chi Chia Seed Pudding but this time I added 1/4 cup of pumpkin puree into the mixer. It was delicious! So I made the Portabella Pizza Bites today for lunch and I remembered to take some pictures this time. This is a great recipe and I hope you decide to try them and enjoy them as much as I do. 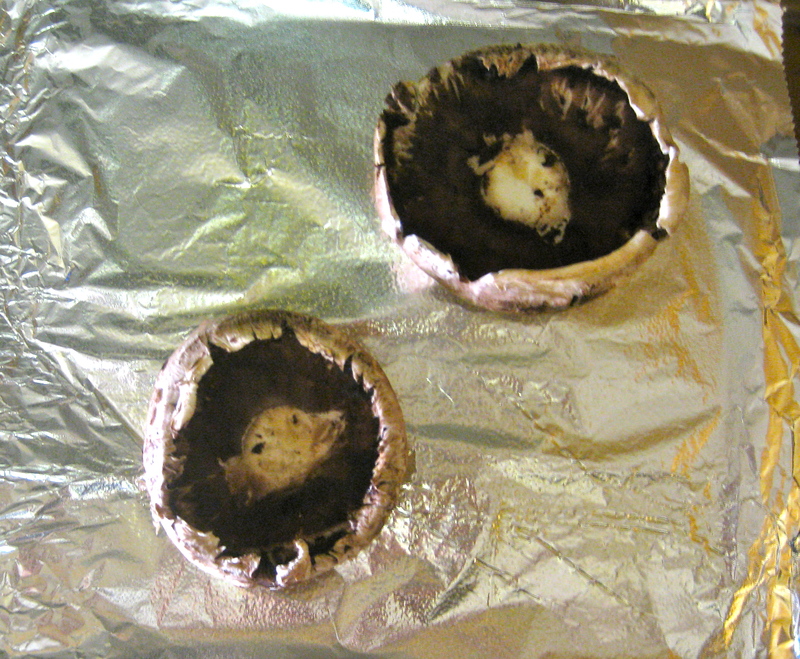 Preheat the oven to 400 F. Clean out the stem and the inside of the mushrooms. Clean off any dust or just wipe the mushrooms down. I do not recommend washing them under running water because mushrooms absorb water like a sponge and they will turn out soggy. Place your mushrooms on a cooking sheet and bake in the oven for 7 minutes. While the mushrooms are cooking you can start making your filling. Mix together your egg white, diced tomatoes, and cheese. After your 7 minutes is up, remove your mushrooms and switch the oven to broil (high). Dab the mushrooms with a paper towel if your mushrooms have moisture coming out of them. Then fill your mushrooms up with your filling you made and place 3 pepperonis on top of each mushroom. Place your mushrooms back in the oven for 4 minutes or until the cheese and egg are melted/cooked. ENJOY! 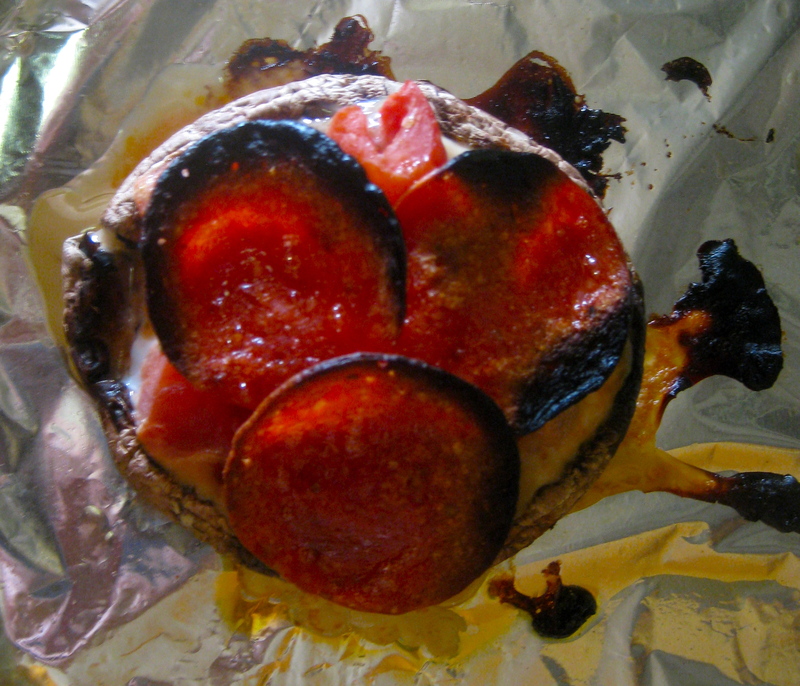 I left mine in a little too long and burnt my pepperoni’s 😦 …still delicious though! I found picture on Pinterest today and felt like this described exactly how I felt. I have a lot of activities that I want to do this weekend already and I getting anxious now for it to be the weekend already. Saturday there is a free Hot Yoga class at South Point Mall and I wanted to take Andrew with me so he can see why I enjoy the classes so much…I also get entered into a $50 gift card drawing if I go 🙂 Sunday there is a 5k in chapel hill that my good friend Caitlin told me about. I have not seen her in a while so I am looking forward to running with her again. I woke up bright and early this morning (5:45am) to go to my circuit training class at Arrichion Gym. I really love this class because it pushes me to do exercises that I would not normally do on my own. It is always good to mix up your routines and always leave your body guessing. Doing the same workout everyday gets boring FAST. Once I got home Chewbacca was waiting for his walk already. We walked Andrew to his car and said bye then he wen on his way to work. I wish Andrew did not have to go in so early to work so we could spend more time together during the week. But it allows us to cherish our weekends together more. After we gave our kisses goodbye, Chewbacca and I headed to the dog park. We played fetch and he played with the other dog for about 20 minutes then headed back for me to shower. For breakfast I made chia seed pudding. This was my first time making it so I just kinda made it up as I went. 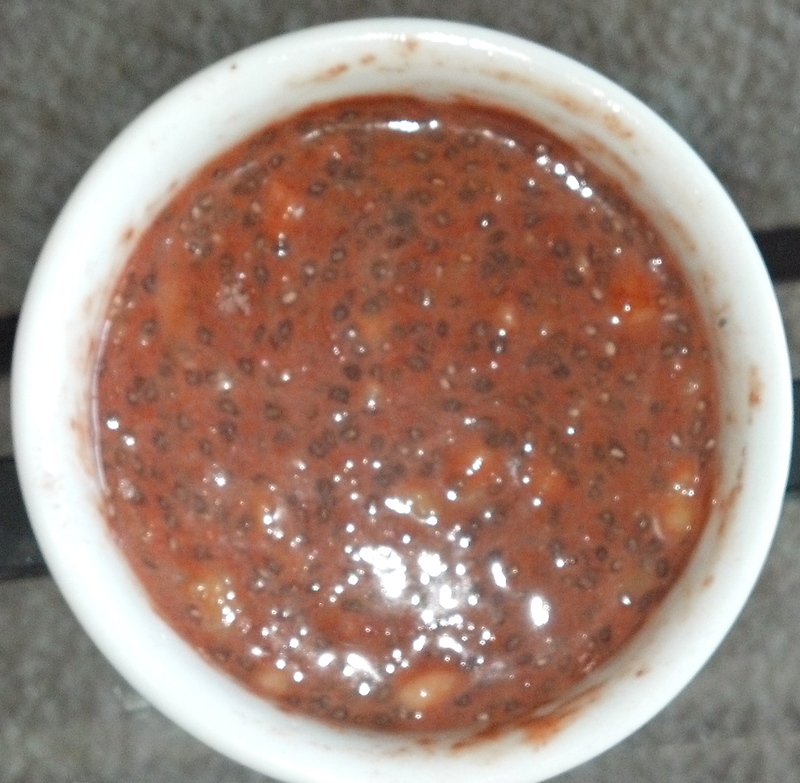 First I mix together 1 tbsp Chia seeds with 5 tbsp of water and let it sit for about 30 minutes in the refrigerator. This was so good and it was not until after I finished that I thought of adding Pumpkin puree to it. I will just have to try that next time. Do you have any fun plans already for your weekend? 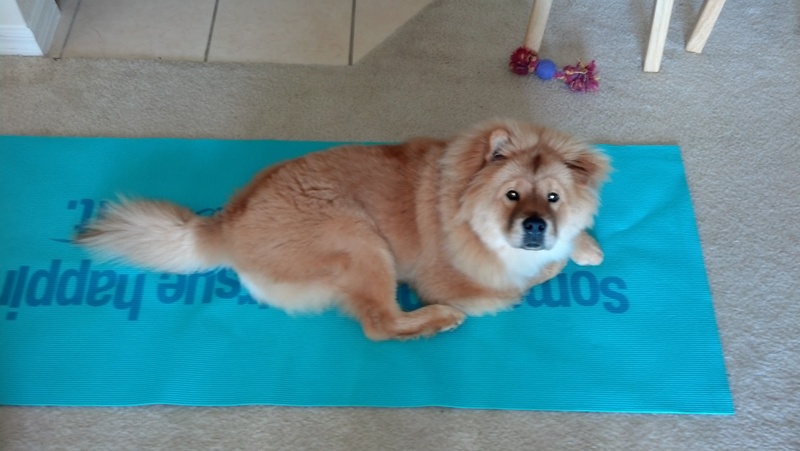 Yesterday morning I went to a Hot Yoga class. It was Black Opal that morning and this is my favorite class so far. It was a flow/vinyasa class and we practiced to fun music and were challenged to try it all. I enjoyed how this class challenged me to really push myself and see how deep I can go in the moves we practiced. I felt like I needed to do a little more yesterday since I had not workout for previous 2 days. 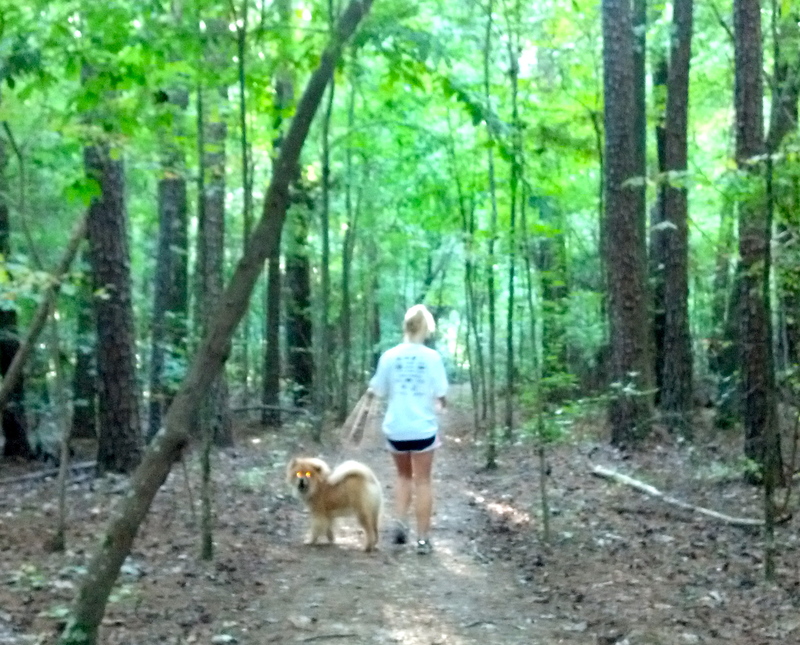 It felt amazing outside yesterday morning so Chewbacca and I went on a 2 mile run. About an hour after our run Chewbacca was ready to go back out AGAIN and play. This time I took him to the dog park in hopes that he could have a play date. There was a black Chow Chow, Bear, out today in the park. It was so cool seeing them play together. I am sorry but I did not take my camera with me so I didn’t get any pictures of the 2 of them playing together. The rest of my day yesterday went like any other…work then bed. Today I did my long run since I did not do one last weekend. 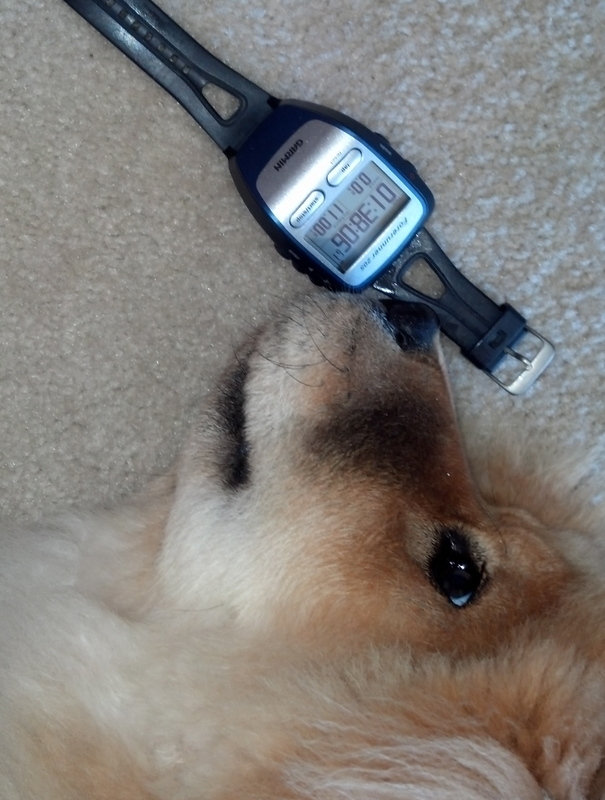 I ran 11 miles in 1 hour 38 minutes, thats a pace of 8:54 a mile. Not my best pace ever but at least I did it :). And once again it was perfect running weather today. This was more a therapeutic run for me today. I like to use my runs to think over things that is going on in my life at the time. Any problem or worries I have had the past week I was thinking over it one last time and then just dropping it and leaving it behind me. I had a visual in my head while I was running that I was literally dropping each issue on the street and leaving it behind me…..I know that sounds a little weird…do you do anything like that? It was a new day, a beautiful day and I wanted to started it off fresh with nothing going on in the back of my head and nothing weighing on my shoulders. This is just another reason, on my long list, of why I LOVE running. Running is my own personal therapist. I can not believe this weekend is almost over. I had an amazing weekend and I do not want it to end yet :(. 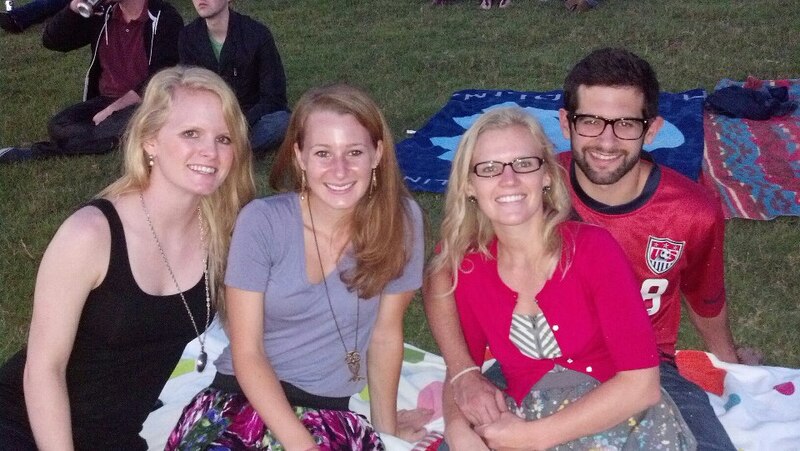 Florence & the Machine Concert Friday night, N.C. State tailgating with family & friends, Umstead Park hiking, Pinterest crafts and recipes. 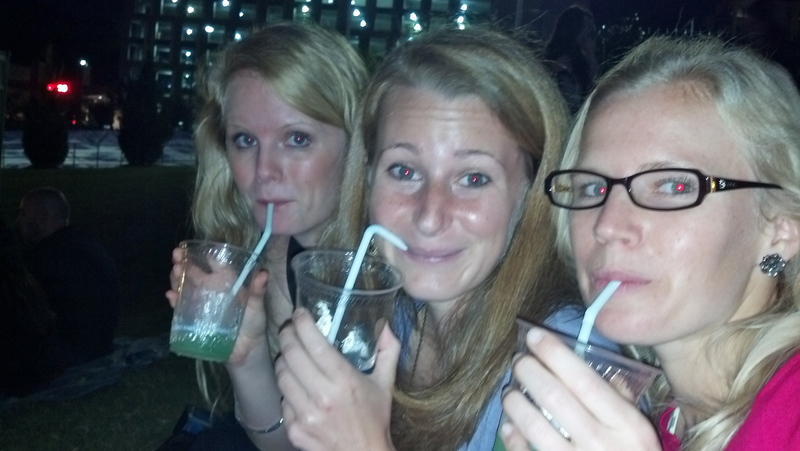 We really enjoyed our spiked slurpees at the Concert! 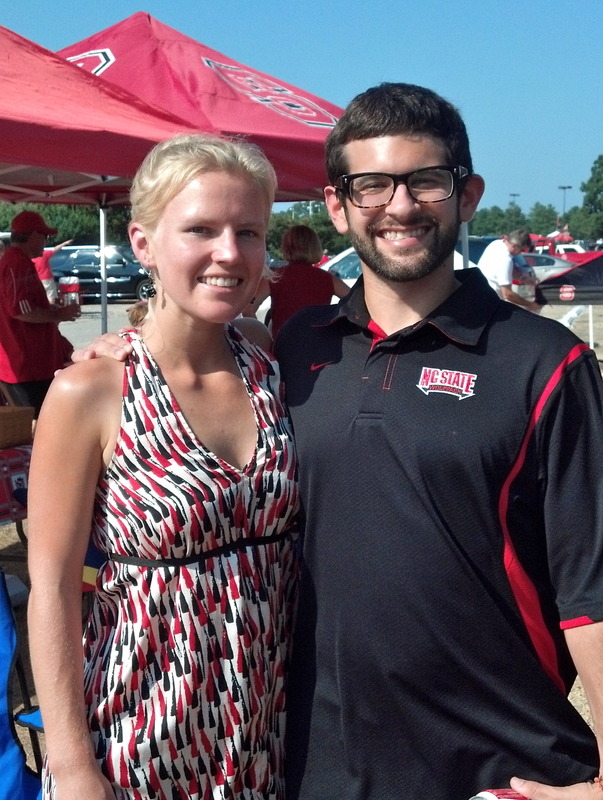 Andrew’s Sister, Kaitlyn, came in town for the N.C. State game..it was great seeing her! Andrew and I woke up early this morning since we fell asleep at like 9pm haha. 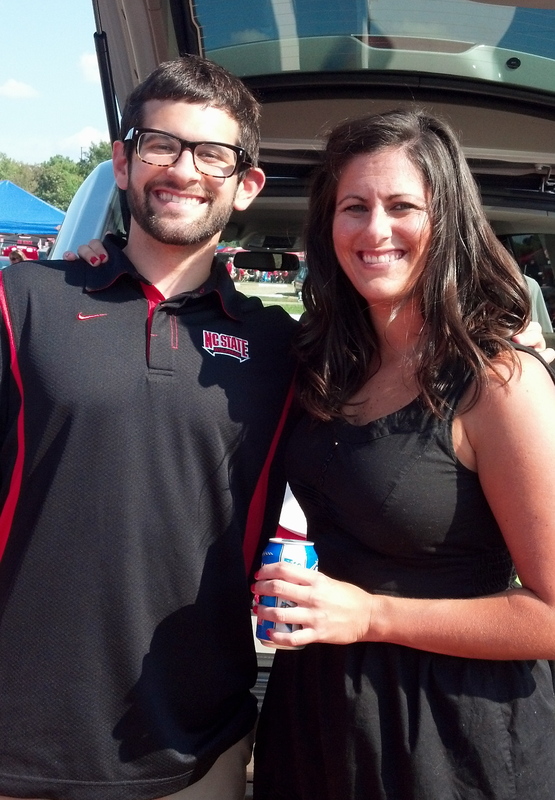 Tailgating wore us out. 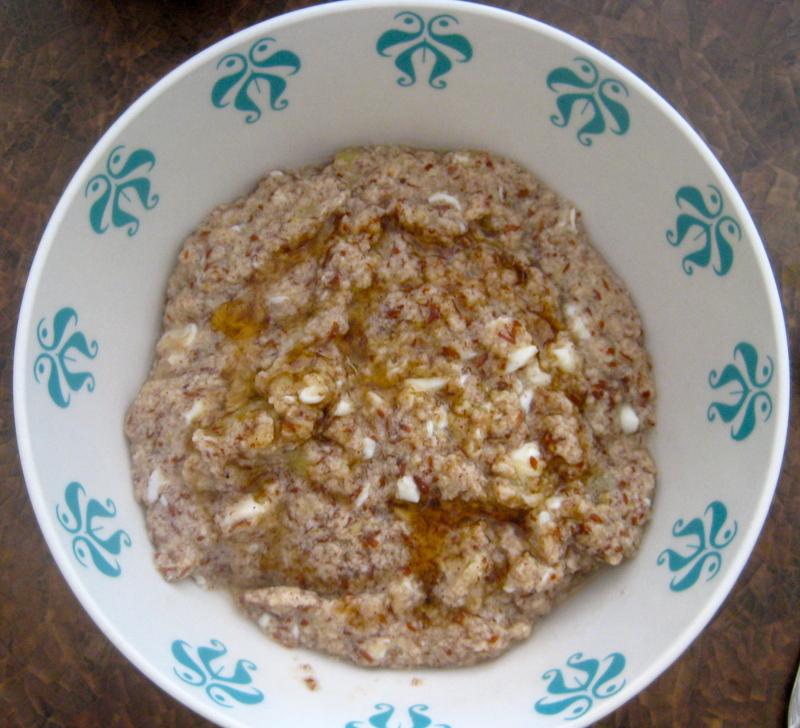 I made “Oatless” Oatmeal for breakfast this morning but added 1/4 a cup of pumpkin puree with it this time. YUM! And to continue my pumpkin cravings my awesome boyfriend picked me up a Pumpkin Spice Latte from Starbucks on his way home from Bojangles. 🙂 Andrew loves to indulge in Bojangles on the weekends. So Do I! but I indulged in CookOut Friday Night after the Florence concert and I figured that was enough fast food for me till next week haha. Chewbacca is HORRIBLE at walking on a leash. So today I decided that I was fed up with him nearly pulling my arm out of the socket and I went to Petco to purchase a harness for him today. We walked around the store for awhile and he seemed to be doing really well in it….YES! I let him pick out a treat while we were exploring petco…he decided on a pigs ear (GROSS!). I dropped Chewbacca off to get his de-shedding wash. His hair has been just falling out for the past 2 weeks…at first I thought something was wrong with him because it was SO MUCH HAIR. They offered me a special scent to put on him during his grooming and their new scent was pumpkin spice…HECK YEA! While Chewbacca was getting his Groom on Andrew and I went by Goodwill and then on to Carolina Ale House for the Jets game. “J E T S JETS JETS JETS”……..WE WON just in case you missed the game. 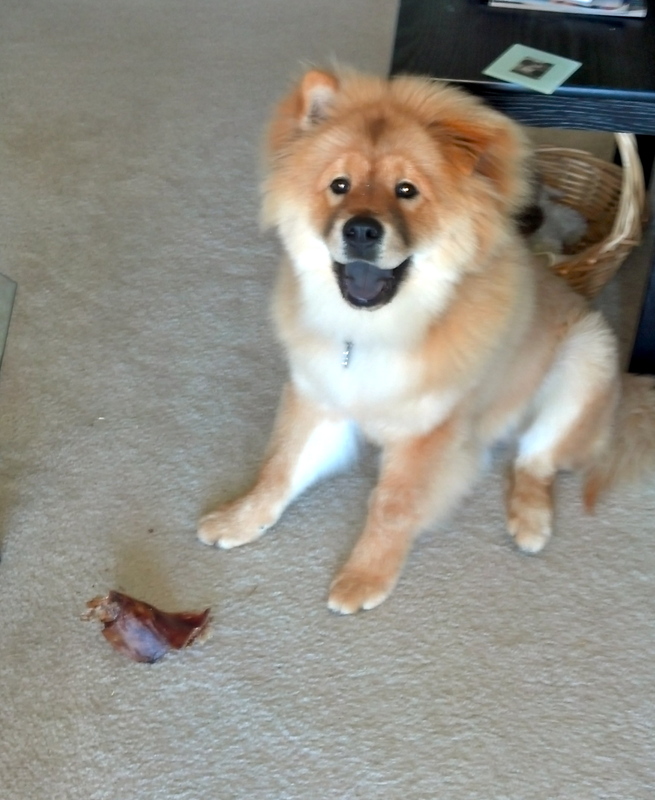 Below is Chewbacca after his de-shedding and his pig ear…He seriously ate the entire thing in about 1 hours. And I LOVE that he smells of Pumpkin Spice all the time …he is like my own personalized scented candle haha. After the game Andrew, Chewbacca and I went to Umstead State Park for a hike/walk. The weather was perfect today and I wanted to take full advantage of it. Chewbacca did so well in his new harness. I am completely satisfied with this purchase. Last night was an amazing night and thanks to my loving boyfriend who made me chug a ton of water before I went to bed last night, I feel great this morning. I decided to finally the “oatless” Oatmeal recipe for breakfast. 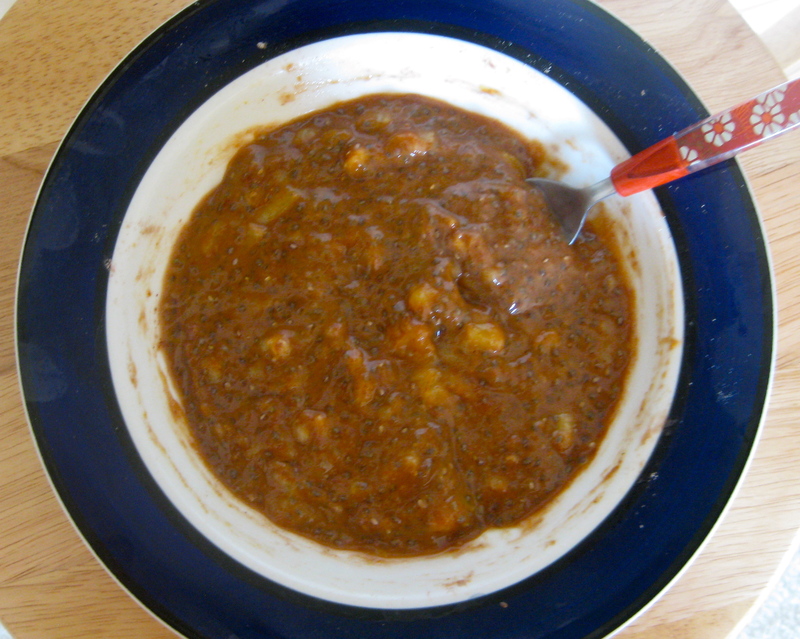 I made up my own recipe from a variety of other recipes that I have come across. I wanted to try this recipe out this morning because of Bess Be Fit’s Blog post yesterday. 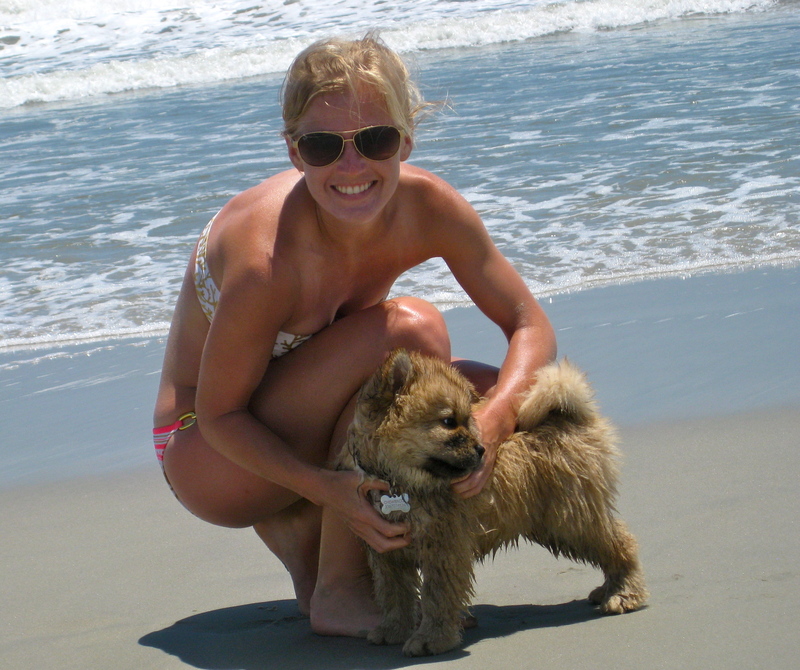 Bess’s blog is one of my favorite blogs to follow; we have a lot of common interest. But her her blog yesterday she talked about her review on the Wheat Belly Book. It really intrigued me to try and go wheat free and see how it works for me. I have a very sensitive stomach, due to either my IBS or my lactose intolerant or both. But I hope to find that this benefits me and helps with some of my digestive issues. Mix all the ingredients together and cook on medium heat till you get a thick texture. 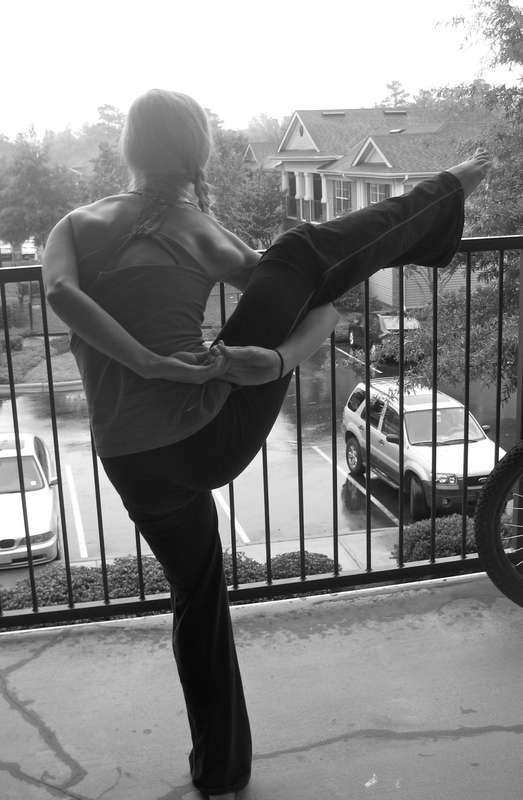 I am going to try and get a quick 30 minute run in this morning before we go Tailgate for the N.C. State Game…wooohh! Which means I must leave you. I hope everyone has a great Saturday and I hope it is just as beautiful outside for you where ever you may be. 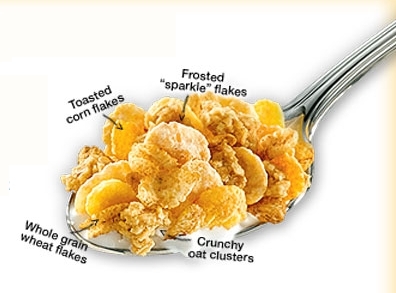 Honey Bunches of Oats all the way. Oatmeal is my cereal of choice now. 2. Coffee or Tea? With or without milk? This is a tuff one because I drink both every week day. I like a splash of soy milk in my coffee (unless it is Pumpkin spice flavored and I do not need anything..It is delicious by itself) and I like to add honey or agave to my tea. 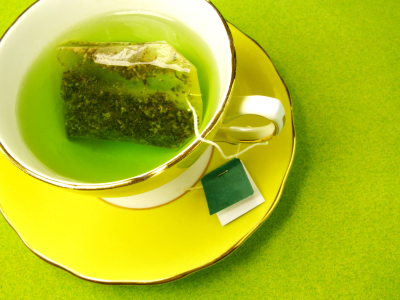 I read in an article before that adding milk to your tea conteracts the antioxidants in the tea. 1. Sandwiches are usually considered a “lunch food”. If you HAD to choose between a grilled cheese and a PB&J, which would you pick? PB & J!! 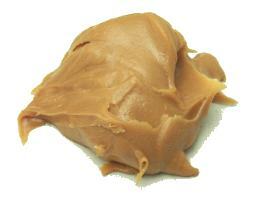 yes I am one of those peanut butter fanatics 🙂 However I choose to eat my almond/peanut butter with a spoon rather then turning it into a sandwich haha. I would rather have a peanut butter and banana sandwich over PB&J too….if you have never tried this before then you are really missing out! 2. You can only put 4 ingredients in your salad (not including greens); what do you throw in the mix? Additionally, which greens and dressing do you pick? tomatoes, cucumbers, mushrooms,avocado and boiled egg (I know it said 4 but that is hard)…I am lactose intolerant so NO cheese for me. I always go for the olive oil and vinegar (balsamic or red wine) dressing…I told you I like things simple. My green of choice would be spinach but really any leafy green will do. 3. 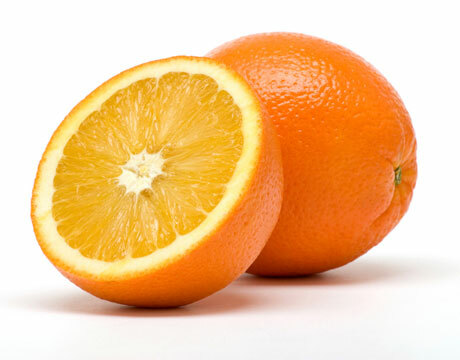 One food you can not live with out at lunch? FRUIT usually I have an apple or an orange along with my lunch every day. 1. It’s the end of the day. You’re tired, hungry, and the fridge is empty. If a fast food (from a chain) is your only option, where do you go and what do you order? Chipotle Chipotle Chipotle….sorry I got a little excited. I always get the Veggie salad bowl with extra lettuce, fajita vegies, black beans, every salsa (minus the Hot one), and guacamole…YUM! This is making me crave it just typing about it. Andrew does not like Chipotle so I usually get it on Special Fridays at work for lunch. 2. TV/Computer on or off while your eating? 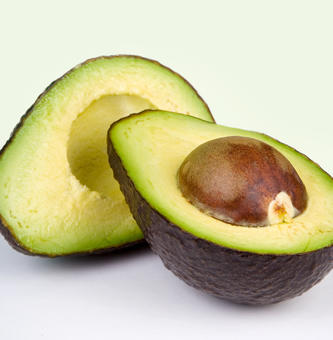 Right now it is usually avocado. I seem to incorporate half an avocado into whatever I am eating for dinner that night, whether it be a salad or quinoa or eggs. 1. 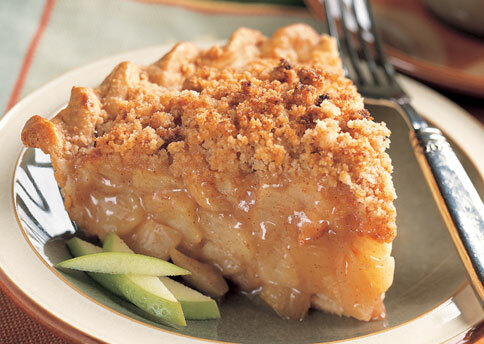 Choose between these two American Desserts: Cheesecake or Apple Pie? Well it back in high school I would have said Cheesecake but since I have become lactose intolerant about 3 years ago it would have to be Apple Pie. 2. Choose between these two foreign desserts: tiramisu (italy) or flan (Spain)? Definitly tiramisu. I love the texture of tiramisu! This is my mom’s favorite dessert. I have never had Flan before so this is not a fair competition for it. 3. Ice cream: cone or cup?